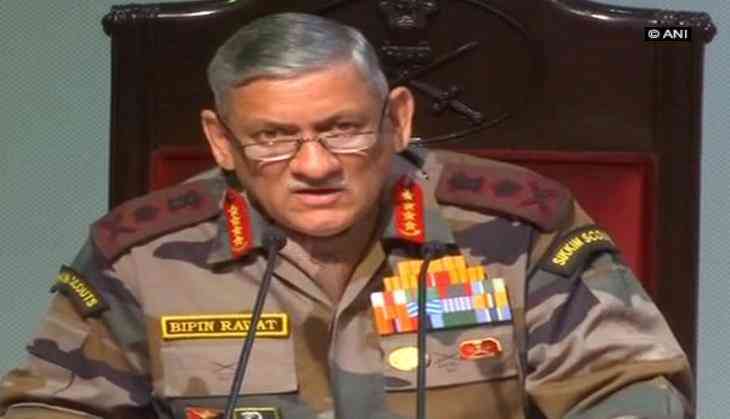 The political initiative must go "hand-in-hand" with military operations in Jammu and Kashmir to bring peace, Army chief Gen Bipin Rawat said today, and favoured ramping up military offensive to pile up the heat on Pakistan to stop cross-border terrorism in the state. Gen Rawat said the armed forces operating in the state cannot be "status quoist" and must evolve new strategies and tactics to deal with the situation, which he feels is "marginally" better since he took over a year ago. In an interview to PTI, the Army chief asserted that there was room for ramping up the heat on Pakistan to cut the flow of cross-border terror activities, clearly indicating that the Army will continue its policy of hot pursuit in dealing with militancy. "The political initiative and all the other initiatives must go simultaneously hand-in-hand and only if all of us function in synergy, we can bring lasting peace in Kashmir. It has to be a politico-military approach that we have to adopt," the Army chief said. In October, the government had appointed former Intelligence Bureau chief Dineshwar Sharma as its special representative for a "sustained dialogue" with all stakeholders in J-K. Asked whether there is room for ramping up pressure on Pakistan to force it to stop sending terrorists to the state, he said, "Yes, you cannot be status quoist. You have to continuously think and keep moving forward. You have to keep changing your doctrines and concept and the manner in which you operate in such areas." Gen Rawat said the Army will have to evolve new strategies and new tactics to deal with the situation. At the same time, he said an overall approach was required to deal with the Kashmir issue. The Army's aim is to ensure that it continues to maintain the pressure on the terrorists and those fomenting trouble there, Gen Rawat said. "I do not think it is time to become overconfident and start assuming that the situation has been brought under control because infiltration from across the borders will continue."